This was a very simple design. I have a friend who is allergic to food colorings and she can never enjoy my cakes. So on her birthday I made her this cake with Chefmaster all natural vegetable dyes. It was interesting to see the muted, earthy colors in fondant. The bird is just simply sculpted by hand, in a folk art sort of style. 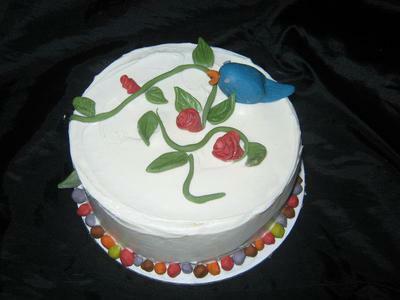 The vines and leaves and roses are all bits of fondant. The ball bead border is a sampler of sorts of all the vegetable dyes and what can be made by blending them together. I loved how they all coordinated because they were all natural. Return to August, 2012 Cake Decorating Contest Submission Form.